I just got the demo version of LogPlot while I wait for my company to buy the full version. I noticed that I can not export to excel if I have an excel window opened. I get the error: Excel is not installed on this machine. I got the same error when doing an excel export with Rockworks. I fixed the Rockworks problem by just closing the Excel windows, but that didn't work with LogPlot. I had to open the Task Manager and end all background processes of excel. This caused another problem to arise. I got to the excel export dialog box asking what exactly I wanted to export to excel, but this dialog box alone creates an excel background process. My workaround was to leave the Task Manager open and delete all new background processes before clicking next on the dialog box. Is this a bug or a safeguard to prevent demo users to export to excel? I am able to export data to Excel (Office 2016) from LogPlot 8 when I am in demo mode, so there may be something different about your Excel installation. What are the other Excel processes that you had to delete in the Task Manager? I'm using Excel 2016 through Microsoft Office 365. I just tried the export again and got the same error. See attached image file. Here is the bug report. Please attach the complete bugreport.txt here or email to [email protected]. Programming reports that the error occurs when attempting to create a new worksheet in the workbook to receive the LogPlot data. Unfortunately, we are not able to recreate the error here, so we suspect that there may be something about your setup that prevents LogPlot from accessing Excel. The Office 365 subscription is one factor that is different with your setup, but I do not expect that to cause the problem. Are you able to double-click on an XLS, XLSX, or CSV file and open it in Excel, or do you have to run Excel first and then open the file? You may be able to test the way LogPlot calls Excel with the attached Windows Script. Download the attached ExcelOpenVbs.Txt rename to ExcelOpen.VBS and double-click on it to run it. Here is what is in the file. wb1.worksheets("Sheet1").Range("A1").Value = "This is a test"
Sometimes repairing the Excel installation in Windows Programs and Features can fix the installation error. 1. Yes, I am able to double-click on a csv file and it opens in Excel. 2. An Excel window was not created when I ran the script. It does create an excel background process. I do believe my excel setup it not normal, but I'm surprised LogPlot cannot access it correctly. My script opens Excel in visible mode on my computer, so there may be something different about your Excel setup. It is also possible that there is a problem with your LogPlot data file that you are trying to export. Save the data file in LogPlot to an .LDAT8 file and I will try to duplicate the problem. Here is the LDat8 File. I got your file and it works fine here. LogPlot 8 first opens a copy of Excel in the background to see if it can make a connection. LogPlot displays the export dialog, and when you click OK, it opens another copy in the foreground with your data, then closes the background copy. The fact that my script sent previously does not open Excel in the foreground (.Visible=True) indicates that your copy of Excel is not supporting a "COM" call to open. I have not been able to find anything on this issue on the web. I will continue to research the issue, but you may want to search as well. Thanks for all your help so far trying to resolve the issue. I tried importing an excel template today and I can not even do that if there are any Excel background processes running. In your Excel File | Options | Advanced, try reversing the setting to Ignore other applications that use Dynamic Data Exchange (DDE). There are some pages on the web that imply that this setting is related to opening new sheets in a new instance of Excel vs in the same Excel window. Please report the current setting, so we'll know what it is before it gets changed. We will continue to research the problem. Luckily, you still have the option to export to Excel when Excel is not already open. I turned the DDE on and with excel still opened, I tried to import. I received a new bug report. I also tried to export and it couldn't find my excel program. Previously you reported that exporting to Excel caused a problem. How does the export work? It appears that the DDE setting will not work with Excel import. I recommend removing the checkmark from the DDE setting in Excel. I have problems with importing and exporting on LogPlot and Rockworks. Neither of them work. 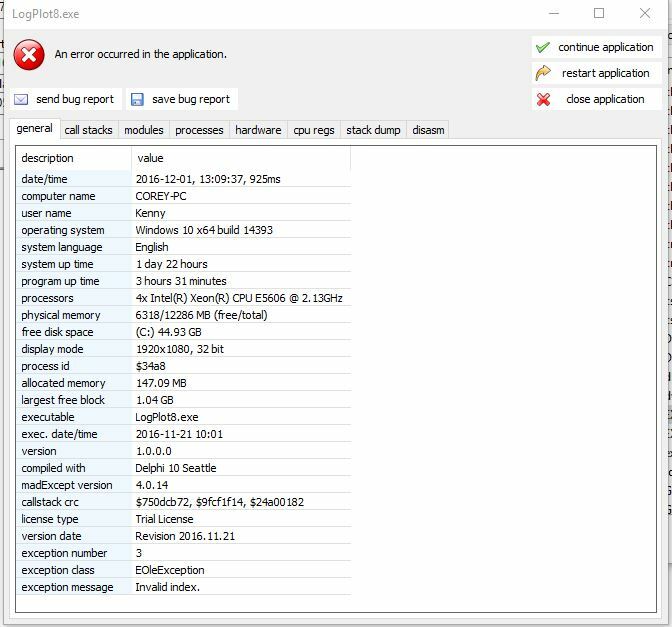 Remove the checkmark for the option to Ignore other applications that use Dynamic Data Exchange (DDE) to return your system to its original state. You may want to try repairing the Office or Excel installation with Windows Start menu | Programs and Features to see if that helps. I did the quick repair and the long repair over the internet last week. It didn't seem to help. We don't have any other ideas regarding how to make your installation of Excel allow a new instance when exporting from RockWorks and LogPlot when there is an Excel window is already open. We cannot duplicate this problem and cannot find any reference to it on the web. We will continue to be on the lookout, but for now, I recommend closing Excel prior to exporting to work around the problem.